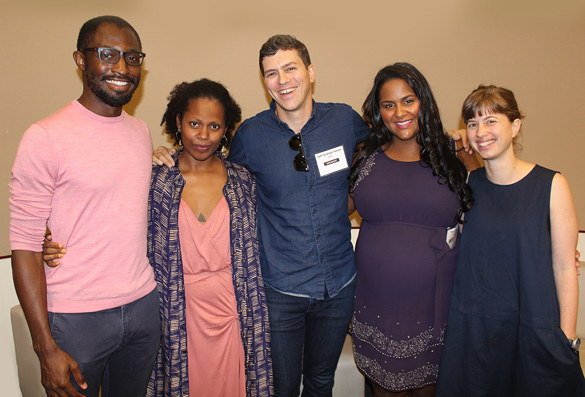 Besides offering New Perspectives, speakers at this aptly named panel at LJ’s inaugural Day of Dialog Brooklyn asked thought-provoking questions. Obama campaign blogger Sam Graham-Felsen‘s debut novel, Green (Random, Jan. 2018), depicts the experiences of a white boy in a mostly black school. His novel is a reflection of his lived experience, “what it felt like to be powerless in a country where I am not powerless.” In explaining his childhood, Graham-Felsen wondered why schools are still extremely segregated more than 50 years after Brown v. Board of Education. Granta Best of Young American Novelists and NYPL Young Lion Uzodinma Iweala‘s debut is Speak No Evil (Harper, Mar. 2018), which is about more than a Nigerian American teenager questioning their sexuality. “How do you tell that immigrant story? What are the fault lines between people who come here with a set of beliefs and how they raise their children? How do you speak about difference?” Another debut is Commonwealth Prize winner Akwaeke Emezi‘s Freshwater (Grove, Feb. 2018), depicting a Nigerian woman in America exploring the intersection between identity and mental health. Noting that the novel was partly autobiographical, Emezi expressed the weight of feeling as if you’re shouldn’t exist in the world or being told that something is wrong with your reality. Creating this work, she added, was a service to others who haven’t been able to articulate their lived experiences. Krystal A. Sital offers a memoir, Secrets We Kept (Norton, Feb. 18), about three generations of women in a Hindu family in Trinidad reckoning with an abusive patriarch. In trying to build a complete picture of this grandfather, Sital realized that her story—which is told from three different perspectives—is about women realizing their own power, especially when struggling with their own truths. Lauren Hilgers’s Patriot Number One: American Dreams in Chinatown (Crown, Mar. 2018) gives a different perspective of identity through the eyes of Chinese protest leader Zhuang Liehong, who now resides in Queens. How much of his identity is in China and how much is in the United States? After asking these questions, Hilgers, who spent six years living in China, explained that some immigrants leave China in the past while others always carry it with them.